This is my second trip, and I have been so looking forward to returning. My memories of the first trip were of beautiful cove beaches at the bases of steep cliffs, the city of Palma I had dubbed “a miniature Paris, the fun we had with our “guide”, another puertorriqueña whose family was from Mallorca! That trip, back in 2010, was before I started blogging, so there was very little written material for me to go on in planning this trip. I did make a photo book, so you can be sure that if I cannot find all the right photos to tell you the story of this trip, I will supplement with those old shots. Boats in the Cala Major, near our hotel. 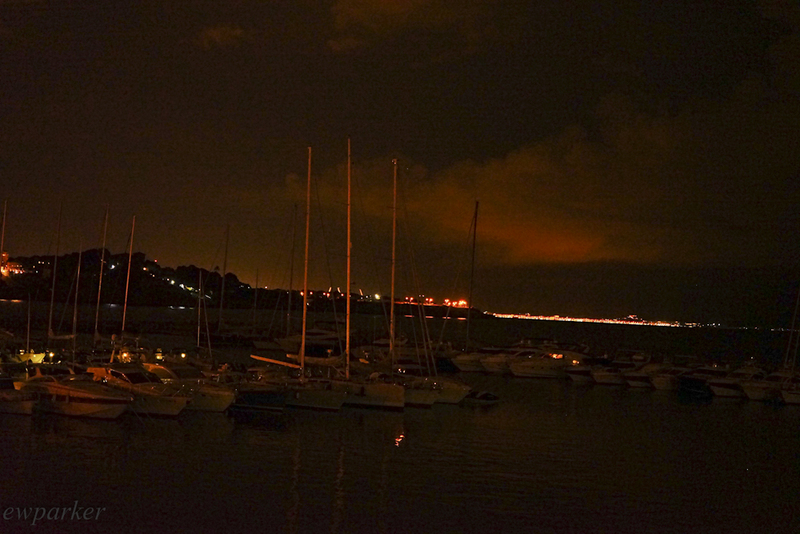 And perhaps it was also fortunate that we arrived in Palma to a rainy day. There was no guilt about spending the first afternoon catching up on our sleep. We emerged in the evening to take a walk and eat a lovely and delicious dinner at a place called Bukaro. Our waiter, a member of the Italian family that owns the restaurant, was charming and we enjoyed talking to him about the “politics of language in Spain” since those of you familiar with Puerto Rico know that the “politics of language in Puerto Rico” is ever a hot topic. 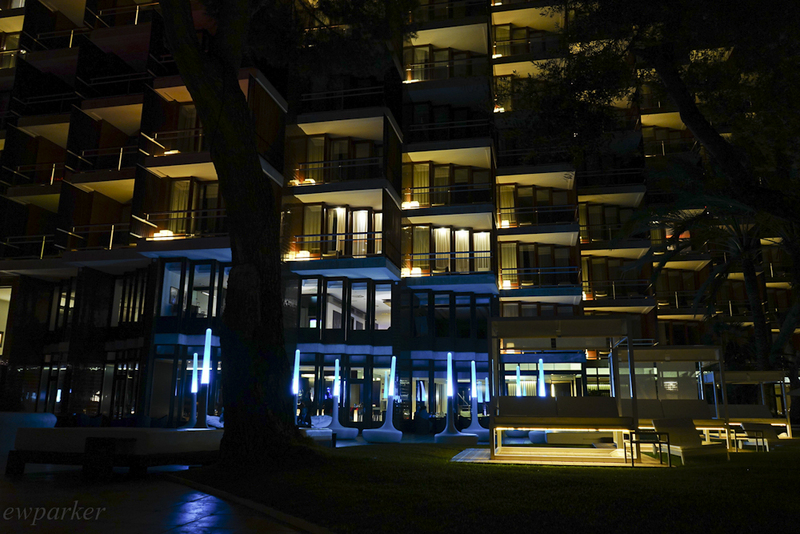 Our hotel is beautifully lit at night. Our first full day was Wednesday, September 30, and it dawned thunderously, literally. The rain was heavy at times and we had lightening to keep it lively. 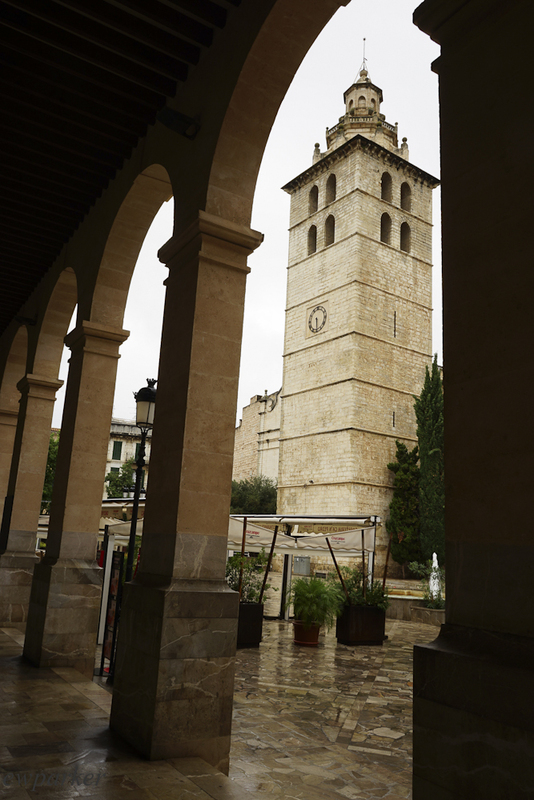 From a quick perusal of the list of things to do in Mallorca in the rain, we chose the Monestir de Nostra Senyora de Lluc (the Monastery of Our Lady at Lluch) and got out of the hotel and on the road close to noon. First, we stopped in Inca to have lunch (Of course. We have priorities!) in a former wine cellar – a place recommended by various sources called Celler Ca’n Amer (don’t ask me what that means today – I have still to ask!) 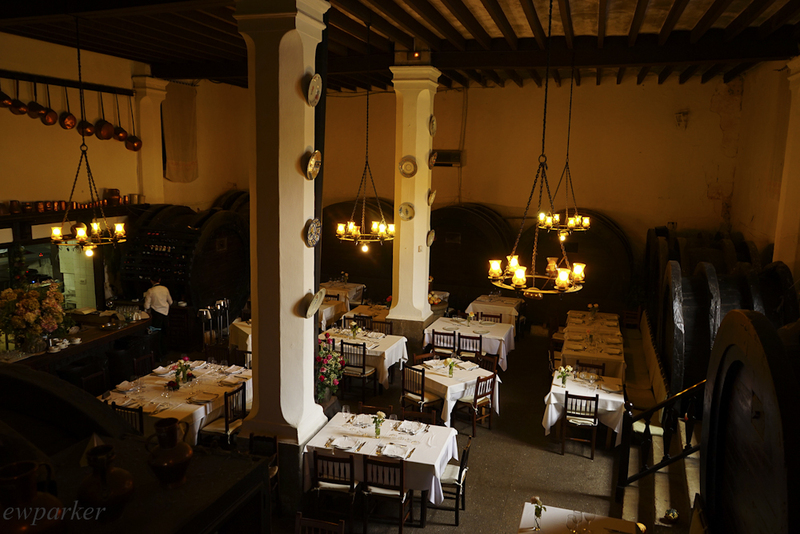 The food was delicious, and the place very evocatively decorated, surrounded as we were by huge casks for aging wine, set well below street level with a very high ceiling. (See the picture.) We had a substantial meal and a glass of Mallorcan red wine – worth the wait until 1:00 pm and the meander around the streets of Inca while we waited. The stop in Inca was not without premeditation: It is touted in our guidebook as a place to purchase leather goods. We looked into many shoe stores, but in only one did we find locally made shoes. 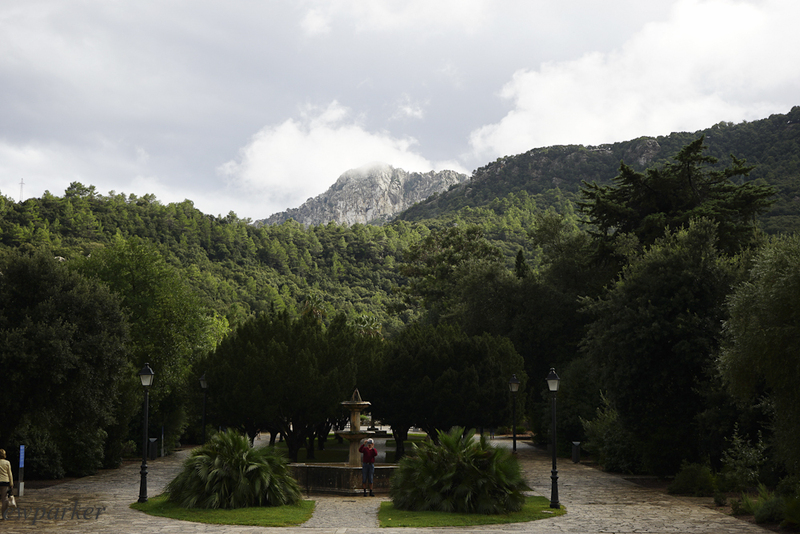 The former monastery is located in the Tramuntana mountain range that defines the western coast of Mallorca. The road was torturous, as these mountains are extremely rugged, marked by deep gorges and savage peaks. They are so beautiful that in 2011 they were designated a World Heritage. Driving them in the rain is a blessing. You are forced to slow down and you get to see so much more that way! 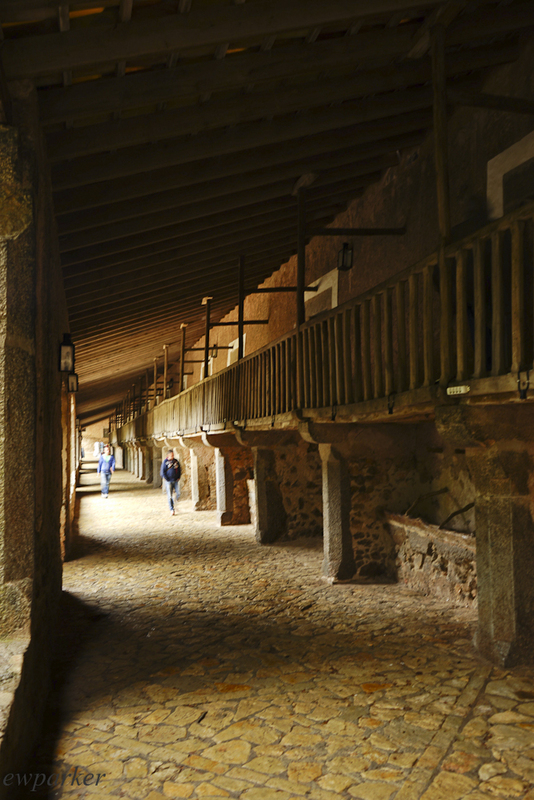 In the monastery, this section served to house pilgrims (rooms on the upper level) and stable horses (mangers on the lower). The monastery is better named the Santuari – the Sanctuary – and in fact you may also see this name. It is the home of a statue of the Virgin. Legend has it that a boy found the statue and brought it back to his village, where it was prominently displayed in the local church. But it disappeared, only to be found again in the same spot he originally found it. Naturally that meant the people had to build a shrine in that place and put the statue in it. 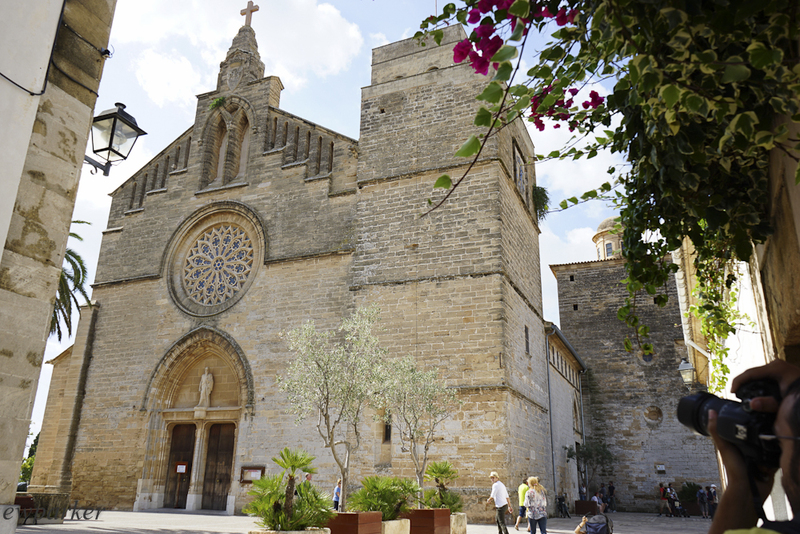 Over the centuries the shrine became a monastery complex, a pilgrimage site, and the “spiritual heart of Mallorca.” A spot with lots of history, it is also a thriving modern community with a famed children’s choir. If you want to hear them, be there between noon and 2:00pm when they sing the mass each day. The day we visited they were off singing elsewhere, but the recording of their voices that plays in the welcome center is nothing less than angelic. At the complex, expect to see a museum with religious artifacts, of course, but also pre-historic artifacts as one of the monks was an archeologist and worked on the excavations of prehistoric caves nearby and ship wrecks off the coast of the island. There is, no surprise, a church (a basilica no less) which is suggestive, but the placement of the famous statue leaves much to be desired in its staging. The statue, sometimes referred to as “the little black one” is indeed blackened “by the cares of the world” or age – choose your preferred reason. It is located in a separate chapel surrounded by gewgaws and the most horrible lighting. She maintains her serene composure through it all though, and you would be remiss not to see her once you have come all this way. “The Little Black One” statue around which the monastery and sanctuary are built. Wander in and out of the buildings and under the porticoes, see the movies and the museum because all of these things will indeed keep you occupied on a rainy day. If however, you visit on a day when it isn’t raining, you will also enjoy your trip because the surroundings are stunning. 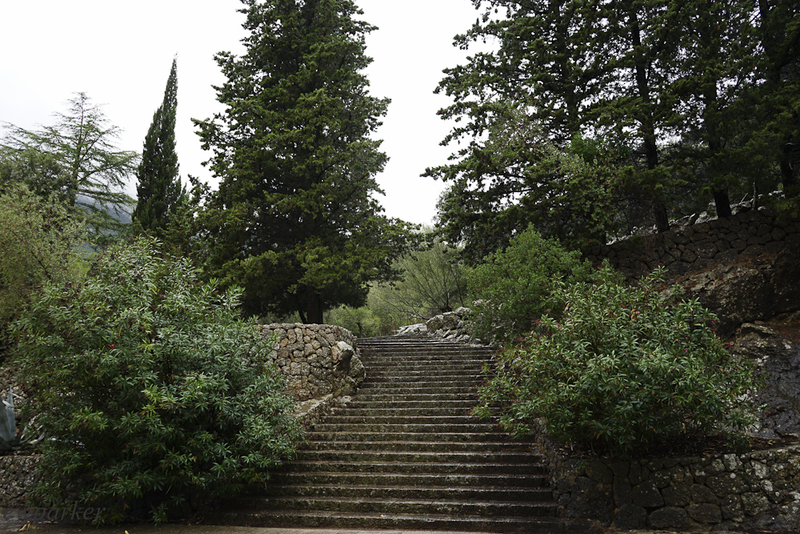 Perhaps you’ll walk on the pilgrims’ walk through the Stations of the Cross until you reach the cross planted at the top of this particular peak where you can look over and out across the Tramuntana range. The weather looked like it was clearing as we left the monastery, so we decided to venture further to Pollença and Alcúdia. It was raining again though so we merely jotted down that we wanted to return to Alcúdia and headed back to the hotel. With our lunch leftovers and a bottle of welcome champagne and fruit kebobs given to us the night before by the hotel, we made ourselves a picnic dinner on the balcony and called it a night. The view of the Serra Tramuntana from Lluc. Thursday (October 1st), a sun-promising morning filled the view from our balcony. We had breakfast in the hotel, on the patio. Intermittent, fine drizzle interrupted our repast several times, but not enough to send us inside. The shining sun won out and remained with us all day. One of the doors from the old walls in Alcudia. Our destination for the day was Alcúdia, a walled city on what is for me the north coast and what is for Gerry the east coast. Wherever you think it is, when you get there, prepare to be charmed. There is ample parking outside the historic center, and there is no doubt that walking is the best way to get around. 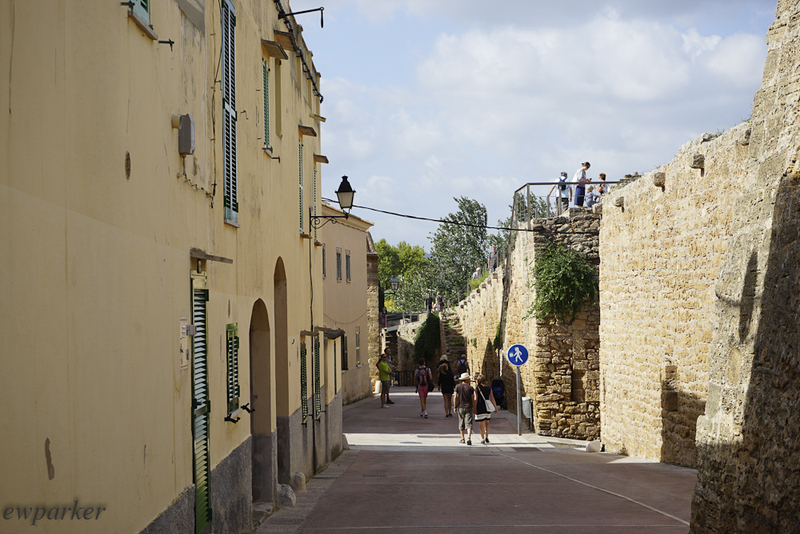 Our first glimpse of the Alcudia walls. 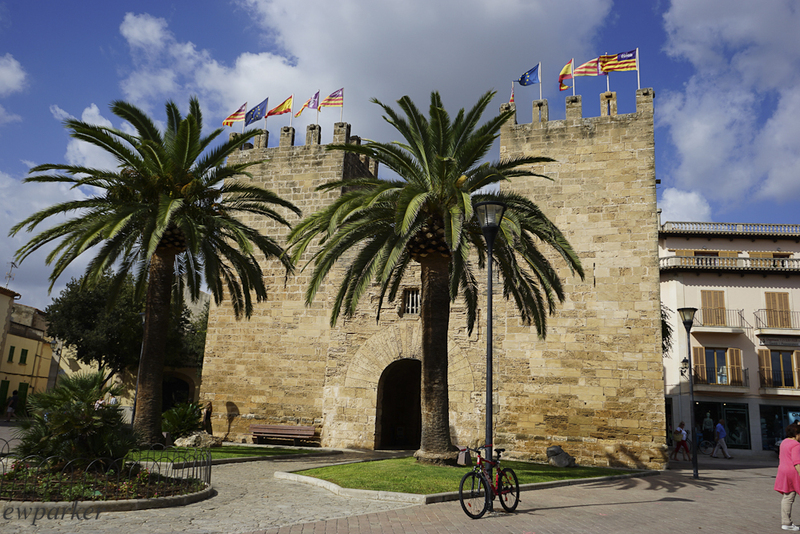 Alcudia is a city filled with narrow stone streets and tourists. We were thankful that we were there on the first day of October – my guess is that the streets would be impassable during the height of the tourist season in June, July and August. As it was, there were enough tourists to generate that crowd excitement, (You know the little frisson of goodwill you feel when you are part of a happy group doing the same thing? )but not too many that it became stressful or overwhelming. Lots of cafes fill the narrow streets and many shops sell artisan wares as well as the usual tourist items. 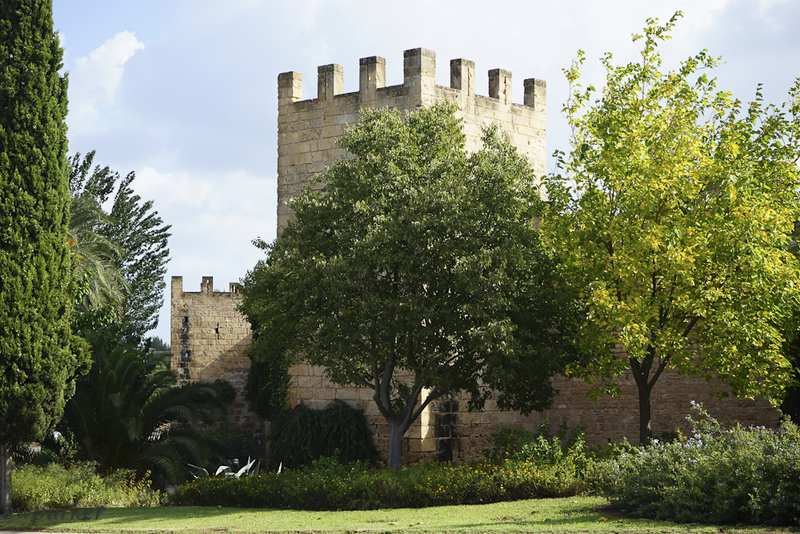 You can wander around the streets, in and out of the city walls, even up and down from the city walls. Everything is very picturesque, colorful and sun-drenched. Sant Juame Church in Alcudia. 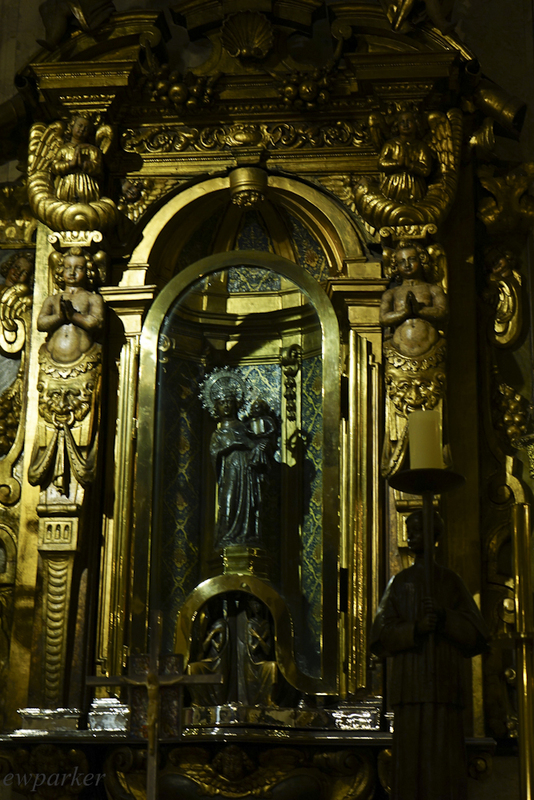 We also went to see the Sant Jaume church, renowned for its many gold alters. Naturally for me, a trip to the Roman era ruins was a must. (One doesn’t spend four years living in Rome without developing an interest in ancient Roman history!) Just outside the walled city (dates from medieval times) are excavations of a city built by the Romans in the first century BCE called Pollentia. There isn’t much to see – the outlines of three residential dwellings, one of which is quite large; parts of what would have been the forum; and a theater. The theater is recognizable, the audience seating carved from rock being pretty much intact still. However, the theater was used for a necropolis in the late Roman times so you can see the coffin shaped niches cut into the stone of the theater. 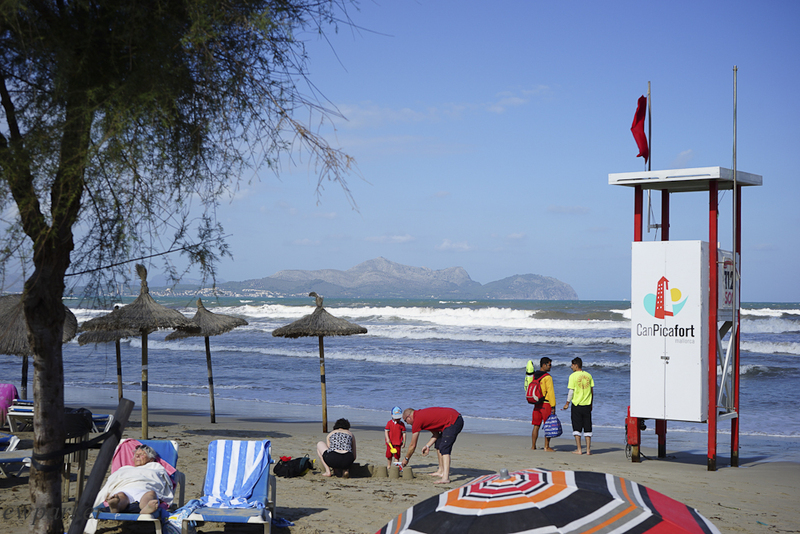 Our destination for after lunch is the Parc Natural de S’Albufera located along the coast to the east of Alcudia. We found a place for lunch on the beach in Can Picafort (pretty awful half a pizza) but the view was wonderful – noisy (big waves) and lively (lots of people-watching). 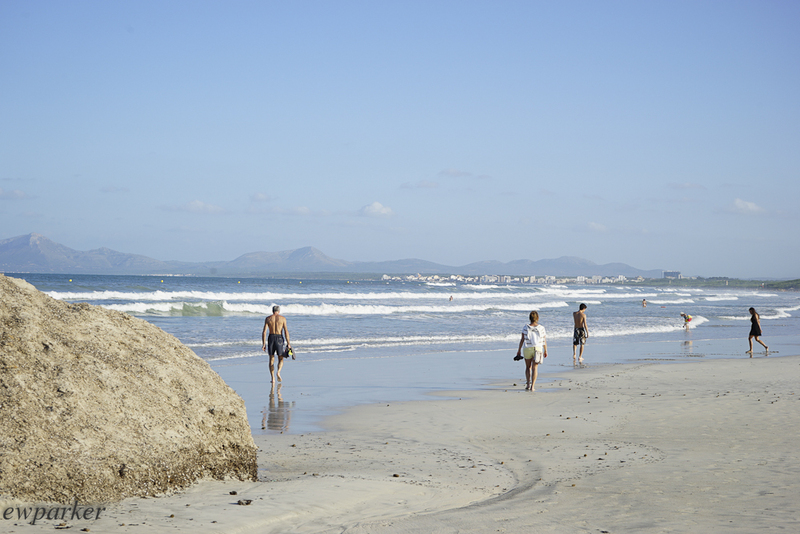 The beach at Can Picafort – that is the peninsula at Port de Alcudia that you can see on the horizon. The walk in S’Albufera was quiet and relaxing. This is the place to see birds, both the feathered and the human versions. The human versions were all carrying 2 foot long lenses and were most often found huddled in these well-placed blinds, their lenses poking out from the viewing slits. The feathered ones were outside the blinds, in marshes, doing their bird things – swimming, wading, fishing, diving, etc. It was a bird lover’s paradise. With neither a map nor an orientation (the information stations were all empty), it was not easy to do anything specific, so we just followed the paths and went where we were taken which was to a series of the blinds I mentioned already. 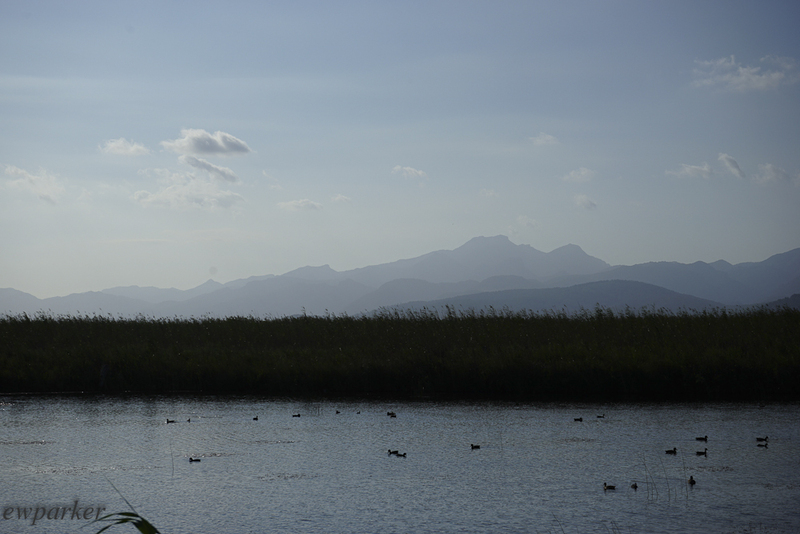 One of the marsh scenes from the Nature Park S’Albufera. The natural park stretches along the beach for quite a distance (the road with the hotels cuts right through it) but as such it contains both marsh ecosystems and beach ecosystems. We saw herons, blue, purple and white; lots of ducks and even the most engaging little wren-sized bird that was striped in brown and tan. The beach portion of S’Albufera. Our dinner was a short walk from the hotel, a place called “Luis.” The food was good, the waiter excellent. Again we tried a Mallorcan wine, Castell Miquel. This one was a white wine made from red grapes, a distinctive taste and a rich gold color.